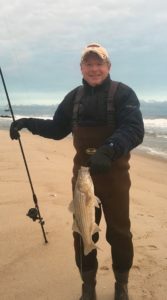 ‘Twas mere days before striped bass season’s end, and all along the beach, not a keeper was stirring—only some rats. December 12, 2017: Late autumn transformed into early winter. Wind, sleet and snow whipped the East End beaches. The fall striped bass run never materialized. 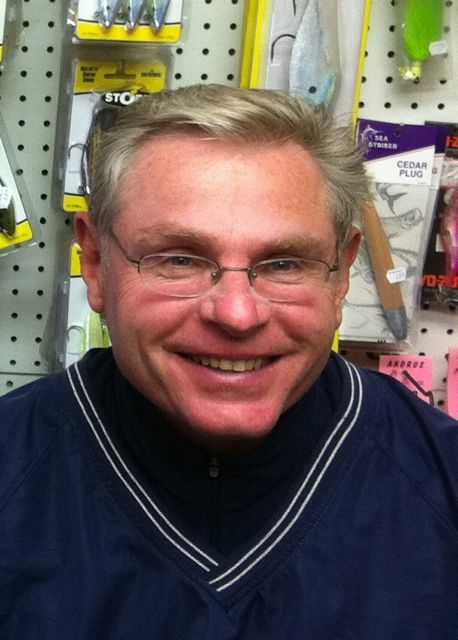 Still, surfcasters hurled on, in hopes that St. Striper would soon hit their lures. November proved to be a festival of tiny bass; “rats”, say the unkind; schoolies or “juvies” those more forgiving call them. THE DIFFERENCE A YEAR MAKES: A 2016 keeper for Amazing Randy, and a juvie in 2017. Keepers, those bass 28-inches and larger, had been virtually nonexistent since Halloween, except for anglers tossing live eels into the nighttime surf. Not exactly my cup of tea of late. 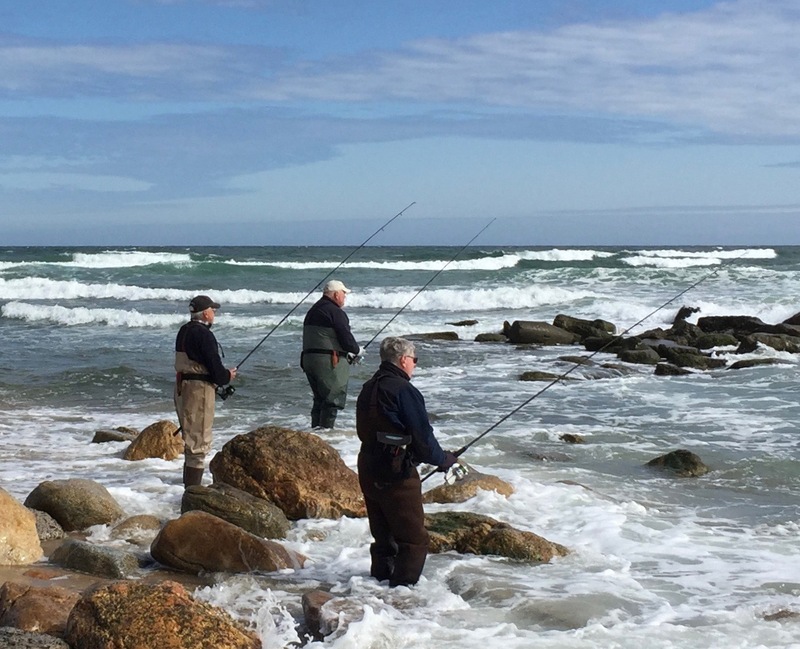 Yet, from sun up to sundown, The Faithful— my rod-and-reel surf companions–persevered, despite the absence of anything large enough to seriously bend their rods, or to bring home for the table. And I too, one raw and fateful December morning, suited up in pursuit of late season Christmas bass. It would be myy last call before the final curtain rang down for the year. 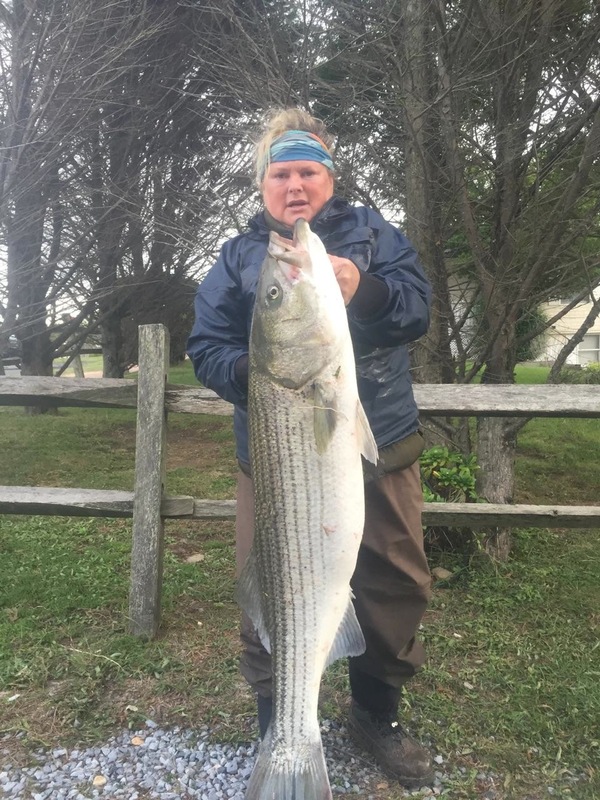 Striped bass season officially ends on December 15. CHRISTMAS COOKIE CLAUSE: it sent me dashing to the beach. The more astute among you might wonder, how it is that I was fishing well beyond the cutoff of my Labor Day to Thanksgiving contract term with the BW? Good question. 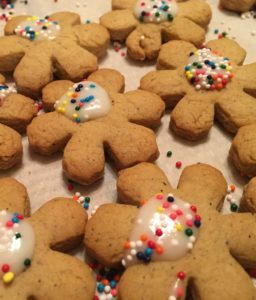 Allow me to explain the little known, rarely invoked, but totally legal “Christmas Cookie Clause”. The fine print implicitly allows that, should the BW overwhelm all horizontal surfaces of the kitchen, dining room and adjacent living room, with materiel and accoutrement of baking, including but not limited to flour, sugar, butter, chocolate, sprinkles of red, green or various other colors, etc., the aforementioned surfcaster is free to abandon the premises and ply his avocation at the beach. GET AWAY FISH: Billy Black’s 22-inch fish was King Rat of the day. 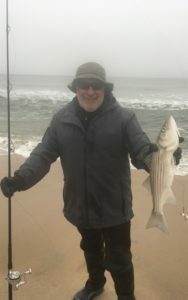 Thus, spurred further by Billy Black’s Friday evening report of his 21-inch striper—“best fish I’ve had in weeks!! !”, he text bragged—I whipped up a couple of steak-and-eggs breakfast burritos, fortified a mug of hot coffee with Scotch whiskey, and away to the shore I flew like a flash. 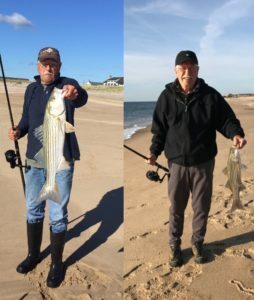 On a favorite beach just west of the East Hampton town line, Billy in sneakers, and I in my waders, settled our brains for some early winter’s casts. Sea and sky were nearly indistinguishable in cold and gloomy alternating shades of gray. Wind chills were in the low 30s. But in short order, what to my wondering eyes should appear, Billy’s rod all aflutter. I knew in a moment it must be a bass. Indeed, there were fish. Not many; Not big by any means—12 to 20 inches on average. But enough that we could ignore the freezing rain stinging our cheeks, and the weird looks we got from dog walkers parading by bundled in fleece and down. LAST CALL: The thrill of which will have to last long into 2018. And then, in a twinkling, came a fish call from World Famous Mel, she, always so lively and quick. We were lured east to the Georgica cut where a rat patrol of six other stalwarts was casting as hard and far as their 11-foot rods would allow, as visions of big bass danced in their heads. Alas, the best any of us could do was a 22-inch fish. This schoolie proved to be Billy’s getaway fish, topping off a half dozen for his morning. I stuck around for a few frigid minutes more, vowing not to end my season on an empty cast, but to go out with a catch—no matter how small. I was using some of my lightest gear, so all my fish this morning came inside the sandbar, sometimes as close as the last curl of the wave. My third fish hit with a jerk and I laughed when it did, in spite of myself. I spoke not a word, but went straight to my work: silently savoring the subtle chatter of my rod tip. As it gently twerked. I reeled slowly, lightly, encouraging the feeble vibrations of this tiny fish to radiate up my arms as long as possible. This “fish on” feeling, subdued though it was, would have to last me deep into 2018. Then I released this juvie to dash away, dash away, and swim out of sight. Into the leaden December sea it disappeared. Happy fishing to all, and to all a good bite. This entry was posted on Tuesday, December 12th, 2017 at 11:31 pm and is filed under Uncategorized. You can follow any responses to this entry through the RSS 2.0 feed. You can leave a response, or trackback from your own site. You’re not so bad yourself, Doc. Jingle Jingle. Bred-finally got to this-too busy reading endless texts! As we always say for the Mets: “wait ’til next year”!